The U.S. federal transport safety regulator is coming around to the view that rules could be updated so that computers in autonomous cars can be considered as drivers, but added that the rule-making could take some time. The move by the National Highway Traffic Safety Administration could be a major boost for Google and a number of companies including traditional car makers that are working on partially or fully autonomous vehicles. "If no human occupant of the vehicle can actually drive the vehicle, it is more reasonable to identify the driver as whatever (as opposed to whoever) is doing the driving," Paul A. Hemmersbaugh, chief counsel of the NHTSA, wrote in a Feb 4 letter in reply to a Google proposal relating to its self-driving cars. Under current federal motor vehicle standards, a rule known as 49 CFR 571.3 describes a driver as the occupant of a motor vehicle seated immediately behind the steering control system. As it designs and tests more autonomous systems that will be controlled by computers, called self-driving systems (SDSs), including some without steering wheels and brakes, Google has asked the NHTSA for advice on the interpretation of provisions in the Federal Motor Vehicle Safety Standards (FMVSSs) for the operation of the new cars. 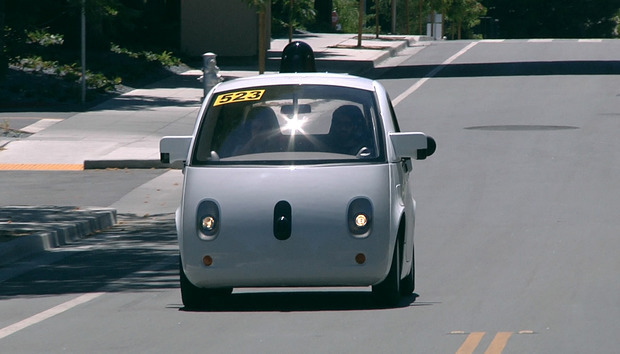 Google's description of its proposed vehicles corresponds to Level 4 Full Self-Driving Automation defined by a May 2013 preliminary policy statement of the NHTSA on automated vehicles, according to Hemmersbaugh. "In essence, Google seeks to produce a vehicle that contains L4 automated driving capabilities, and removes conventional driver controls and interfaces (like a steering wheel, throttle pedal, and brake pedal, among many other things)," he wrote in the letter to Chris Urmson, director of Google's self-driving car project. Google did not immediately comment on the letter. The company is said to have expressed concern that giving mechanisms to human occupants of the vehicle, like a driver, that would let them control steering, acceleration, braking, or turn signals, or providing human occupants with information about vehicle operation controlled entirely by the SDS, could be detrimental to safety because the occupants could attempt to override the decisions of the computer. NHTSA will consider updating Section 571.3 in response to the changing circumstances, but acknowledged that it could take time. It has suggested that Google should seek exemptions from existing rules in the interim, including rules that govern the requirement of service brakes that can be activated by a foot control, and the location, identification, color, and illumination of motor vehicle controls, telltales, and indicators. In 2013, NHTSA said in its preliminary statement of policy that if a state permits operation of self-driving vehicles, other than for testing, at a minimum a licensed driver should "be available at all times in order to operate the vehicle in situations in which the automated technology is not able to safely control the vehicle." It said it would review its decision as innovation in the area continued and the maturity of self-driving technology increased. The U.S. plans to spend close to US$4 billion over the next 10 years on pilot projects in the area of autonomous vehicles and will also come up with a model regulatory framework to govern the use of the technology on public roads, Transportation Secretary Anthony Foxx said last month.